Scientific name: Cucumis melo L.
The many cultivars of muskmelons (Cucumis melo L.) make a delicious addition to a summertime garden. Smooth-skinned cultivars include casabas, crenshaws and honeydew melons. 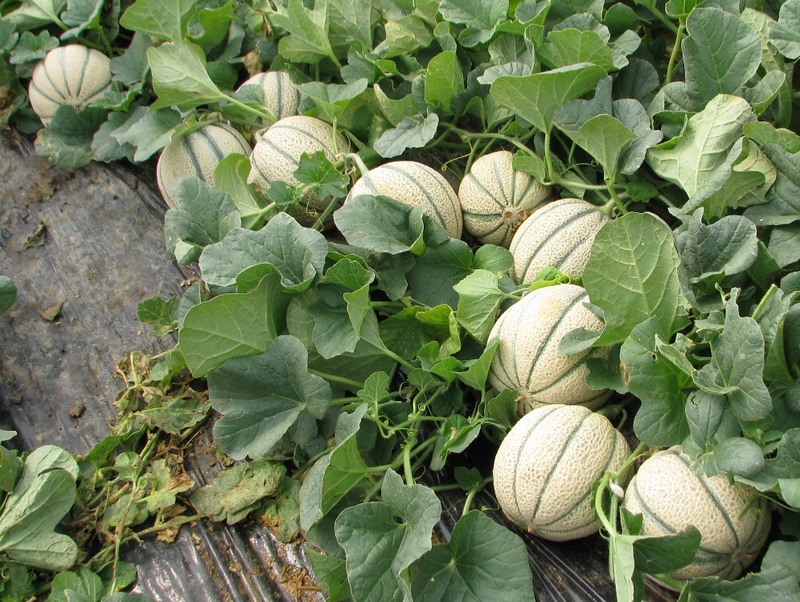 Cultivars with nets on their skin include cantaloupes and Persian melons. from Turkey to China, including northwest India, Afghanistan, and Uzbekistan. of Montreal in 1535 and in the vicinity of Philadelphia prior to 1748. Muskmelons grow best with average monthly temperatures of 65 to 75 degrees Fahrenheit and ripen best in dry weather. They like loose, rich soil with a pH of 6.0 to 6.8 that is well drained. Add aged manure to the planting beds the fall before you plant them. emergence and stand establishment. Overhead irrigation is most frequently used. However, drip irrigation, with plastic, is becoming more frequent and is highly desirable. quantity of foliage and incidence of fruit disease compared to overhead irrigation. Plant seeds in full sun 1 inch deep three to four weeks after the last expected frost in the spring. At 65 degrees Fahrenheit, the seeds will germinate in about 10 days. Alternatively, plant seeds indoors in biodegradable paper or peat pots about six weeks before planting time. Biodegradable pots are necessary because muskmelon seedlings grow poorly if their roots are disturbed. Plant in mounds or hills or in rows that are five feet apart. Mounds should be 24 inches across and four to six feet apart. When the seedlings on a mound develop three or four leaves, use scissors to cut the three or four weakest seedlings level to the ground. Space the seedlings 18 to 24 inches apart in rows. Muskmelons respond well to the application of black plastic mulch to control weeds and early season insects. Apply the mulch two to three weeks before you plant the melons, making holes for the seeds or seedlings. The mulch helps protect the plants from early season cold spells and unless it gets extremely hot, you do not have to remove it until the plants begin to flower. If you use black plastic mulch, use 1 pound of actual nitrogen, 2 pounds of phosphorous and 3 pounds of potassium for 1,000 square feet of plot space before planting. Increase the amount of nitrogen by 25 percent on bare ground. Fertilizers are rated by three numbers that indicate the ratio by percentage weight of macronutrients nitrogen, phosphorus and potassium. Nitrogen promotes the growth of vines; potassium helps melons develop. Muskmelon can fall prey to pests and diseases that affect the gourd family of plants. Watch out for striped cucumber beetles. They often damage the melons, chewing through the plant and spreading diseases like bacterial wilt and the cucumber mosaic virus. Use yellow sticky traps to catch cucumber beetles or cover the seedlings with row covers. Aphids can also be a problem. Flush the aphids off the infested plant with a forceful stream of water, early in the day. Flea beetles can affect the plant as well. Use floating row covers to protect the plant from insect damage until flowering appears. Keep an eye out for powdery mildew, which looks like talcum powder on the foliage and other parts of the plant. You may also have to deal with fusarium wilt, fungal leaf spot and scabs. Employ routine scouting and immediately remove all weak and unhealthy plants. You can also use a broad-spectrum biocide for initial control. To discourage fungal diseases, keep the weeds in check and ensure proper aeration among the foliage. Weeding is best done before the vines start to run, as later you risk damaging the vines. Cantaloupe seedlings are sensitive and easily disturbed by weeding and thinning. Seedlings are normally thinned when they reach 10 cm in height. great deal of hand labour. Melons are usually picked every other day for the first two or three picking days and every day for the next 20 to 25 days. Length of harvest in a planting depends on condition of the vines, number of melons, season of year and the market. Assuming good cultural practices are followed, one can expect to harvest about 2 000 to 5 000 melons per hectare when grown on bare ground and between 6 000 to 12 000 when using plastic mulch. Up to 20 000 fruit may be obtained with some of the smaller-fruited varieties (less than 1 kg). 2 to 7 °C. Ripened cantaloupes (equivalent to full slip) may be stored at 0 to 2 °C.